Kota Tua Jakarta, where the history of Jakarta begins..
Kota Tua Jakarta is the area of first settlement in Jakarta. It starts from Sunda Kelapa harbor to Pecinan (China Town). Thus, this area is rich with history. Initially, Sunda Kelapa harbor was known as Kalapa and it belonged to Pajajaran kingdom. When an army from Demak and Cirebon took over this area, their leader named Fatahillah built a town surrounding the harbor. The town was named Jayakarta. 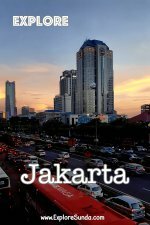 Presently, the date of the establishment, June 22, 1527 became Jakarta’s anniverssary. In 1619, the Dutch East India Company, popularly known as VOC (Vereenigde Oost-Indische Compagnie) under Jan Pieter szoon Coen usurped Jayakarta and changed the name into Batavia, as a remainder of their founding fathers, the Batavir. Since then VOC built many buildings in this area until 1850. However, when VOC went bankrupt in 1799, this area was abandoned. The next Governor General, Daendels, brought down some of these buildings and used the materials to build a new town called Nieuw Batavia a.k.a Weltevreden in the area known as Lapangan Banteng. 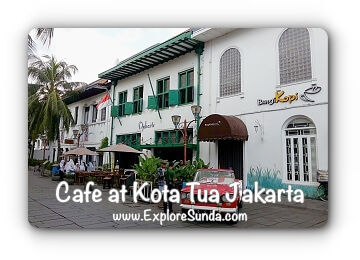 Fortunately, there are many beautiful buildings still remained in Kota Tua Jakarta. Once abandoned, now the government started to revitalize this area. Some of the buildings are already renovated, they are returned to their prime condition. Six of them are functioned as museums, hence, the area is known as District Museum. The central area of the old town is Fatahillah plaza in front of Fatahillah Museum. 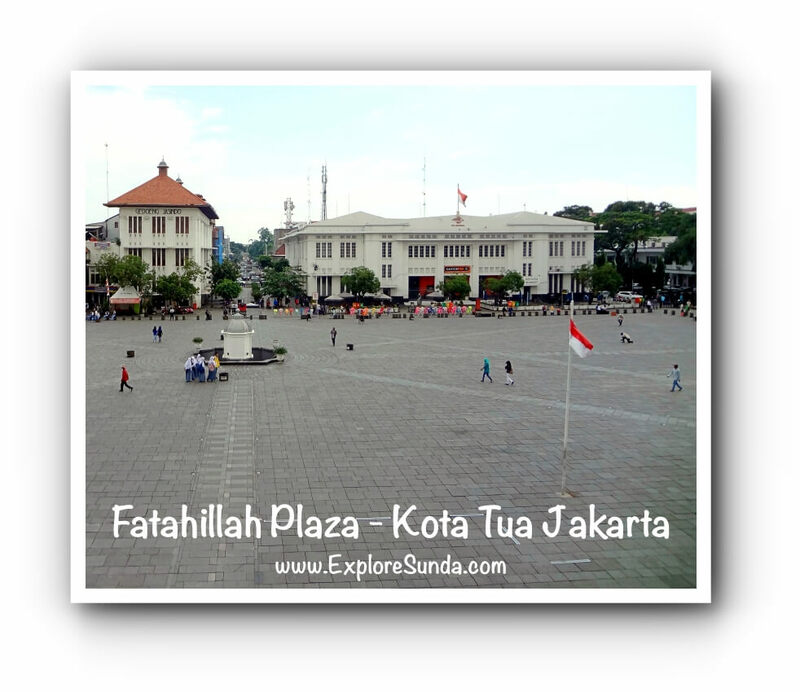 Fatahillah plaza is surrounded by Puppet Museum, Fine Art and Ceramic Museum, Batavia Cafe, and Postal office. Many people visit Fatahillah plaza, especially on Sundays. It is a huge open area. 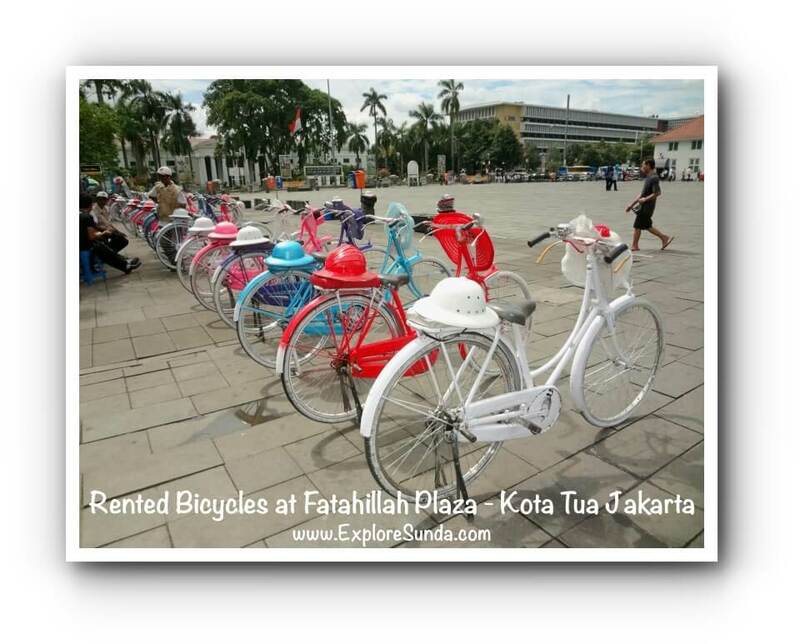 We can rent bicycles to ride around the area. The bicycles are colorful. Instead of bike helmets, we will be wearing lacy hats for ladies or old fashioned hats for gents. 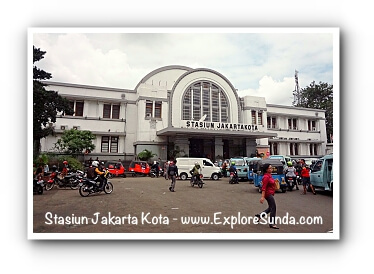 Located as the gateway to the old town, it is one of the oldest train station in Indonesia, popular as Beos. No one knows for sure what Beos means, but according to one version it is an acronym of Bataviasche Ooster Spoorweg Maatschapij (East Batavia Train Company). Today, Beos station is still busy as ever, servicing the commuter lines in the greater Jakarta area. The building itself has been stated as historical building since 1993. 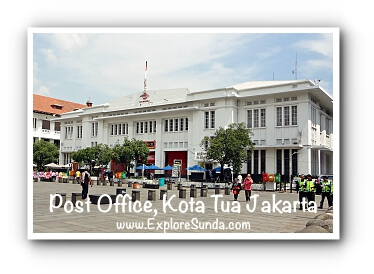 Located right in front of Fatahillah museum, it is still functioned as one of the post office in Indonesia. It occupies a grand building that was built in 1928 as support offices for the city hall. 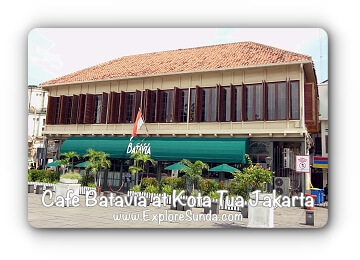 The most legendary cafe in Kota Tua Jakarta, cafe Batavia was built in 1805 as governors’ residence. Its interior is dominated with old photos and furnitures that reminds us of Batavia in the 19th century. When it was renovated in 1992, the owner found a tunnel between the basement of the cafe and Fatahillah Museum. In english the name of the building means Red Shop. It got its name since it literally has red walls. It was built in 1730 for Governor General Gustaaf Willem Baron van Imhof’s residence and several of his successors. Since then it had changed ownerships and became offices, shop, bank and finally it was restored in 2012 and became a function hall. The address is Jalan Kali Besar Barat No. 11, on the other side of the river from Jakarta History Museum. The easiest way to reach the old town is using public transportations such as TransJakarta bus (corridor 1: Blok M - Kota) and train’s Commuter Line. They will stop at Stasiun Jakarta Kota a.k.a Beos train station. Although using private cars is the most comfortable way, the traffic around the old town is very crowded all day long and it is difficult to find parking spots, unless you come early in the morning. Exploring the old town can be quite challenging, mostly due to the heat as well as the huge area we want to cover. Fortunately, there are some restaurants, cafes, and canteens near Fatahillah plaza. 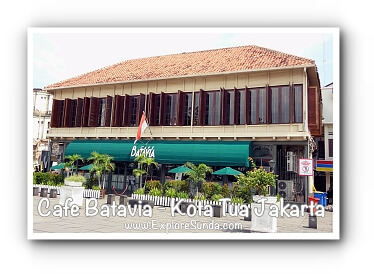 The biggest one is Cafe Batavia, right in front of Jakarta History Museum. It serves fine dining. The interior is decorated with classic furnitures and old photos where we can see a glimpse of Jakarta in the past. Should you only need a cold drink, there's a convenience store next to Cafe Batavia. If you prefer to relax a bit in a cafe, there are a couple of cafes in the west side of Museum Fatahillah. 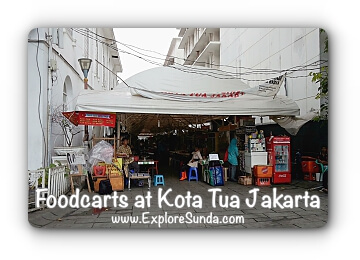 Another option is the food carts serving traditional foods in an alley near Museum Wayang. You also can get some food inside Beos train station. You can choose from several international and local franchise such as KFC and A&W. 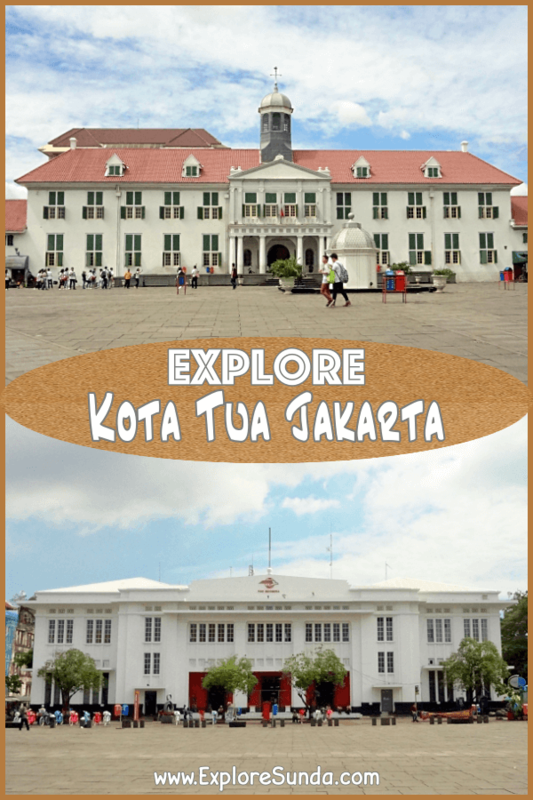 The District Museum in Kota Tua Jakarta is a good start to see the beginning of this city. 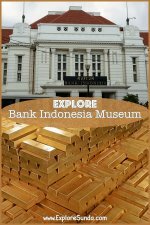 Then you can take the free sightseeing bus tour or TransJakarta bus to Monas and Museum Gajah (National Museum of Indonesia). 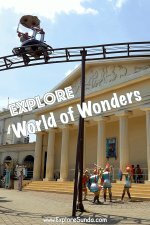 If you want to know more about Indonesian cultures, you should spend some time in Taman Mini Indonesia Indah.